Asparagus and creamy Gruyere create a delightful twist to this popular snack. Preheat broiler. Bring a large sauté pan of salted water to a boil over high heat. Add the asparagus and cook until tender crisp, about 2 minutes. Transfer the asparagus to a colander, refresh under cold running water to stop the cooking, and drain well. Set aside. In a small bowl, combine the cheese and ham; toss to mix. Set aside. Using your fingers to hold the garlic, rub the clove against one side of the toasted bread to flavor the entire surface. Drizzle or brush with a bit of the olive oil. 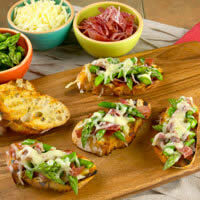 Arrange the blanched asparagus on the toasts, then divide the cheese and ham topping evenly over the asparagus. Season with salt and pepper. Place bruschetta on a baking sheet and broil just until the cheese melts and begins to brown, about 1-2 minutes. Keep a careful watch so as not to burn.